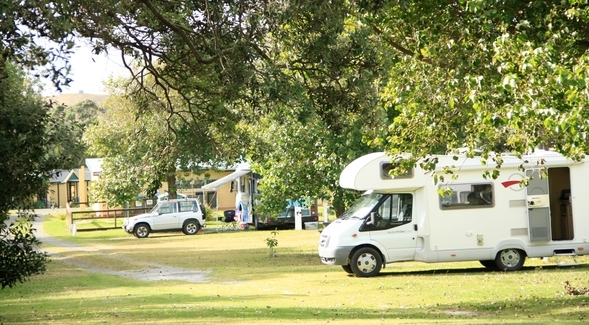 Baylys Beach Holiday Park offers accommodation for every type of traveller – whether you are on a family holiday or you are travelling the world with your backpack. This Dargaville holiday complex is situated only a short walk from the spectacular long remote sandy beaches of the west coast of Northland. The local takeaway Sharkies is open 7 days a week. Activities at Baylys Beach include coastal walks, surfing, surf casting, horse trekking, quad-bike riding on the beach and playing a round of golf at the local Northern Wairoa 19-hole golf course. The beach is ideal for 4-wheel drive groups, paragliding, parasailing and land yachting. Or for getting married. Take your pick from fully self-contained cottages to budget cabins and flat grassy camp sites set amongst native coastal trees. We have a large communal kitchen, covered BBQ area and outdoor seating, laundry, high-speed internet and play areas for the kids. The beach is a 5 to 10-minute walk down to one of the jewels of the North and the longest driveable beach in New Zealand, the west coast’s 112km-long Ripiro Beach. Watching the sun set into the sea is one of the delights to experience, and the magical colours of the beach cliffs are a photographer’s dream. See the wonder of history by looking at the black lines of past kauri trees embedded into the cliffs and sometimes exposed on the beach at low tide. This beach is also where many a shipwreck has been discovered - see the Dargaville Museum for more information. This magnificent west coast beach goes for miles, even longer than the more famous 90 Mile Beach.